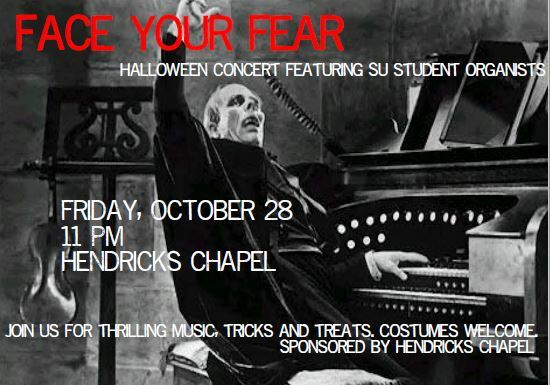 Back by popular demand, Face Your Fear is a Halloween organ concert experience not to be missed. University student organists will present a program of spooky music for the “King of Instruments” against a backdrop of atmospheric lighting and visuals at 11 p.m. Friday, Oct. 28, in Hendricks Chapel. The event was held the first time last year and drew nearly 300 students. Treats and costume accessories will be provided. For further information, contact 315.443.2901.